It fits nicely on a table top and I tend to use it standing up. 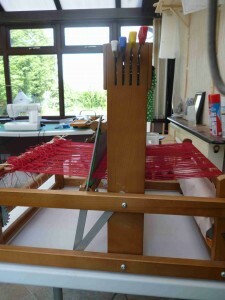 You can get special stands/tables that position the loom at a suitable height for sitting at as well. The coloured leavers on the right hand side of the loom raise and lower each of four shafts, in the picture you can only see two of the levers because the other two were raised . Depending on how you warp your loom and then in what order and combination you lift the levers you can produce different patterns of weave. To weave you need to put a warp on running from front to back through the wire heddles on each shaft and through the reed which you can see leaning back against the castle of the loom. As you lift the shafts using the coloured leavers a gap is created called the shed. Using a shuttle the weft yarn is taken through this gap, the shed, beaten into place by moving the reed forward and then the position of the shafts changed. Here’s a picture of a boat shuttle and stick shuttle. Boat shuttles are more expensive than stick shuttles but so much easier to work with. As you can see the boat shuttle has a spindle in the centre whereas with the stick shuttle you simply wind the wool around the shuttle. Having a shuttle as wide or wider than the width of fabric that you are weaving also makes the process a lot easier because you simply pass it from hand to hand through the shed of the warp. 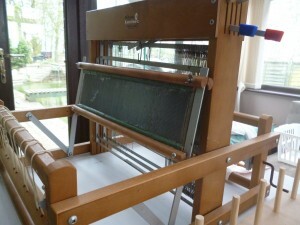 If you read about weaving at all you’ll find a lot of information about how to warp your loom. Essentially you can warp front to back or back to front. It is quite time consuming but I found I got a lot quicker after doing it the first time. So far I’ve used a direct warping method using a warp peg simply because it’s the quickest way and I wanted to get weaving. If you google direct warping you’ll find lots of info and videos about how to do it. 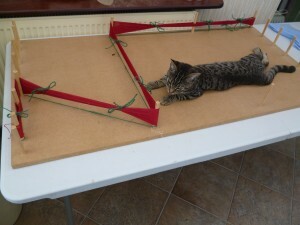 Essentially you tie your warp thread onto the back beam of the loom , put your cone or ball of warp thread on the floor behind the loom then take a loop of the warp thread, pass through a wire heddle of one of the four shafts, though the reed and around the warp peg . 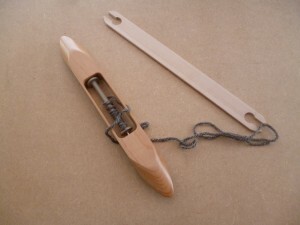 The warp peg is a small wooden peg that you attach to a table edge at whatever distance will give you the length you want for your warp and therefore piece of fabric. You continue taking loops of warp thread passing them over or under the back beam alternately until you have warped the width that you want. This method does mean you have two warp threads passing though each gap in the reed. With thin yarns this isn’t a problem but with thicker yarns you may, depending on which reed you use, struggle to move the reed or create a shed to weave with.If you’d rather have single warp yarn leave a gap between each as you warp and then move one yarn along into that gap. 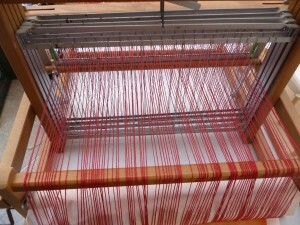 Once you’ve wound your warp yarn onto the board you have to transfer it to the loom. I haven’t tried that yet but there are several methods to avoid it all turning into a knotty mess. I’ve mentioned the four shafts and moving them in a certain order to make patterns. Each shaft has wire heddles which you thread the warp yarn through. As you raise a shaft the yarn is raised by the heddles and then lowered when you drop the shaft. For a beginner a simple weave is to warp in the order 1,2,3,4. This means that the first warp yarn is threaded through a heddle on shaft 1 the second warp yarn through a heddle on shaft 2 and so on in a repeating pattern. When weaving you lift shafts 1 and 3 together, place the weft yarn using your shuttle then lower shaft 1 and 3 and raise shaft 2 and 4. In this way different warp yarns are raised and lowered over and under each weft yarn creating a weave. I haven’t got any Hooters Hall Jacob wool yet so I bought some Jacob wool yarns. 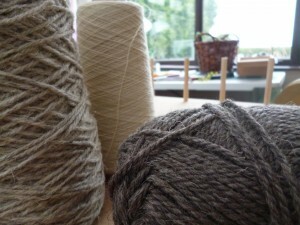 Here’s a picture, as you can see I’ve got two lighter coloured yarns one thin one thick. 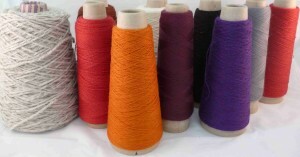 I’ve used these as warp and did find the thinner yarn easier to deal with. However, I think having a different reed would make a big difference. 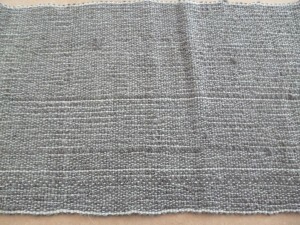 I’ve been using the darker wool as my weft. I wanted to use contrasting colours so it would be easier to see any mistakes. This is a picture of my first attempt. I was really pleased with this. There were a few places where I had skipped a warp yarn but this is easily rectified. 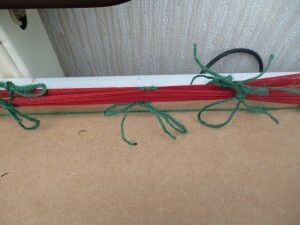 I did a zig zag stitch with the sewing machine across the end to finish off. the fabric has a lovely drape and I was suprised how easy it was to sew on the sewing machine. I’ve also tried experimenting with a thicker yarn for the warp. 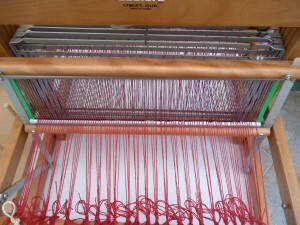 For my first attempt I had direct warped the loom and had two warps going through each space in the reed. 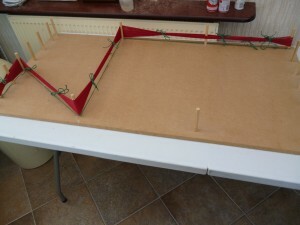 With the reed I have this made it very difficult to move the reed and I also struggled to create a decent shed. I think if I had a different size reed this could be resolved. 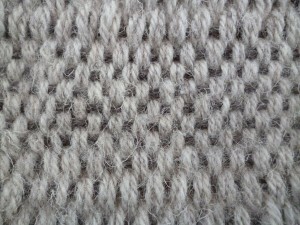 In this close up you can see that the warps are made up of two yarns. Finally I tried using the thick warp again but only singly. This made it easier to move the reed and to create a decent shed to pass the weft through. 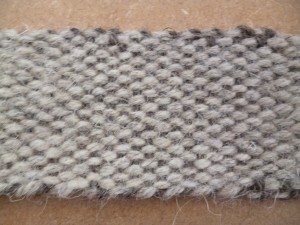 Obviously with only a single warp and using a contrasting weft you get more of a checked pattern. Out of all three I prefer the first attempt mainly because of the drape and softness of the fabric. I’m planning on getting some different sized reeds and to start following some weaving patterns to create fabrics with different patterns.